One of the great things about this trailer is that it focuses more on moments, on characterization & theme, than plot - we really don't know a whole lot more about what actually happens in the movie than we did before (which shows an admirable level of restraint for Disney, though I suppose it's easy to do trailers "right" for a movie that sells itself and already has an enormous marketing campaign behind it). Following on the heels of the earlier teasers, this trailer really cements the roles of the three (presumed) main characters in relation to the original trio of main characters: Rey is the Luke, the listless blue-collar worker on a remote planet, yearning for something more. Finn is the Han, the conflicted warrior looking for a cause. And Poe is the Leia, the one member of the trio already entrenched in the formal Rebel hierarchy (and who looks to get tortured as well). 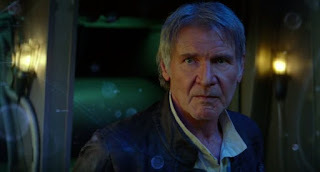 But what this trailer also does well is suggest ways the new trio could fit into different archetypes, and thus, become richer characters: Rey seems like a more jaded, weathered person than Luke was initially (shades of Han), and the initial shots of a masked, staff-carrying Rey recall Leia's Boush disguise from Return of the Jedi; the shots of Finn wielding a lightsaber, while not an absolute guarantee that he's Force sensitive, at least suggests the possibility that he could end up on a similar path to Luke, and his jacket is very similar to the one worn by Luke at the end of New Hope (and in Marvel's current Star Wars series); and the shots of Poe flying an X-wing call to mind both the more "high adventure" aspects of Luke and the seasoned warrior side of Han. 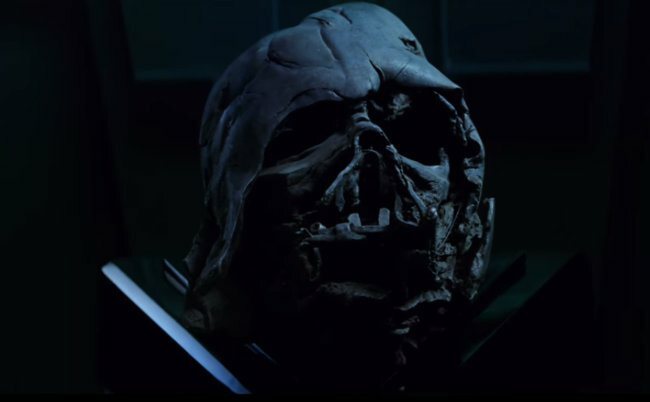 This trailer certainly seems to suggest that Kylo Ren is both an admirer of Darth Vader and the one in possession of Vader's crumpled, charred mask, but it's important to note this could be a trick of editing. The dialogue is clearly Ren's, but the shot of the mask could be from somewhere else in the film entirely, leading us to believe Ren is speaking that line to the mask when he's not. "It's true. All of it. The Dark Side. A Jedi." A few things about this much-discussed line of dialogue from Han. 1. It's "a Jedi", not "the Jedi". 2. The line certainly seems to suggest that, unlike what happened in the old Expanded Universe, the canonical post-Jedi years did not see a resurgence of the Jedi as Luke slowly but surely rebuilt the Order and/or the real truth about what happened aboard the second Death Star, that a Jedi returned and helped destroy the Emperor, isn't public knowledge throughout the galaxy, possibly because the remains of the Empire are still strong enough to suppress the truth. Either way, this strongly implies that the details of the events of the Original Trilogy are as shadowed in mystery to the general public of the Sequel Trilogy as the events of the prequels were to the public of the Original Trilogy, which is an interesting choice to make. 3. It's definitely telling that it's super-cynical Han, of all people, delivering the line about how everything involving the Dark Side and a Jedi is true. Again, characterization is a focus along with everything else going on in this trailer. Just love that little bro-pat Poe gives Finn as they seemingly prepare for battle. Says a lot about the state of their relationship at that point without spoiling anything specific. Our first full shot of Leia (assuming she was the one holding Luke's old lightsaber in the earlier teaser) has her tearfully embracing Han, giving hope to us Expanded Universe fans that at least some of the core ideas put forth there may make it into the new canon (that is, it's still possible they did remain together and/or get married after Jedi). Pulling back from earlier-released shots featuring a lightsaber-wielding Finn facing off against Kylo Ren, we can now see that Ren is unmasked for at least part of that confrontation (and channeling Jon Snow a little), which suggests that, unlike Vader, his mask is something he chooses to wear and not something required to keep him alive, which is a smart choice (not ALL Star Wars villains need to be part robot, desperately clinging to life via the aid of machines, and it strengthens the idea of his devotion to Vader if he wears a mask in honor of him, rather than because he has to). The previous trailers had me interested in this movie, but I don't think the reality had settled in yet. This trailer, along with the movie being just around the corner, has me really excited. I love the idea that Han has moved from not believing in "some all-powerful Force" to explaining that it was all true. To continue your analogies, he seems like the Obi-Wan of this movie. I also love that the return of the Jedi is unknown to the general public. I liked a lot of the old expanded universe stuff, but Luke rebuilding the Jedi Order just always seemed a bit off to me for whatever reason. Pretty much the one thing I don't like from what I've seen and heard so far is that the Empire apparently still rules the galaxy. (?) This is based on the Rebels now being called the Resistance, which makes it sound like they haven't made much headway in the past 30-plus years. They blew up two Death Stars, killed Darth Vader and killed the Emperor himself, but they're still on the defensive after all that? I don't really like it. But I'll reserve total judgment until I've seen the movie. To continue your analogies, he seems like the Obi-Wan of this movie. You know, I hadn't really considered that, but you're right. Plus, the trailers seem to suggest that he's the one who gets Rey off Jakku, thus furthering his role as the new Obi-Wan/theshold guardian who gets the hero onto their path. Which, of course, just heightens the likelihood of Han dying in this movie. I've been operating under the assumption that Luke is the new trilogy's Obi-Wan (and thus not long for the films), but nothing in the trailers thus far has supported that idea. Whereas Han definitely does seem to be slotted into that role, at least based on what we've seen. I liked a lot of the old expanded universe stuff, but Luke rebuilding the Jedi Order just always seemed a bit off to me for whatever reason. Whereas I love the new Jedi order stuff, just because it seems like the most obvious post-Jedi development to me (other than Han & Leia getting married), and I'm a little bummed by the trailer's implication that Luke is still the only Jedi running around. Basically, the more Jedi there are, the happier I am, because the Jedi are what set Star Wars apart from every other sci-fi property. Everybody's got ships and blasters and aliens and cocky rakish pilots, but only Star Wars has super-powered warrior monks with laser swords. They blew up two Death Stars, killed Darth Vader and killed the Emperor himself, but they're still on the defensive after all that? I don't really like it. As you say, it'll all come down to execution, but I am also a little wary of this idea. What's confusing is that there's already been indications in some of the new post-Jedibooks & comics that the Empire is essentially defeated (at least, forced into a treaty with the New Republic) roughly a year after Endor (the Battle of Jakku, which led to the Star Destroyer we've seen in the trailer crashing into the planet, being the last hurrah of the Empire prior to the treaty being signed). That a resurgent faction of the Imperials could rise up decades later to threaten the New Republic in the guise of the First Order certainly works, but then I'm not sure why the New Republic would become the Rebellion-esque Resistance (unless the First Order proved to be spectacularly successful in reversing the Empire's fortunes, winning back the galaxy and reducing the New Republic back to a nominal rebellion - which would fit overall with the film's seeming tone of "make everyone think of the Original Trilogy" but would also be almost as disappointing as having the Rebels still being Rebels and fighting the Empire 30 years after Endor, since it's functionally the same thing. But, as you say, we'll just have to wait and see how it all plays out. I wouldn't be surprised to see Han die in this movie. As I recall, Harrison Ford wanted Han to be killed off in RETURN OF THE JEDI, but Lucas nixed that suggestion. I could see LucasFilm luring him back to the role by promising him the death scene he'd asked for all those years ago. "Basically, the more Jedi there are, the happier I am..."
But, and I can't exactly explain why, the Jedi Academy idea has rung false to me for a very long time. Maybe not all the way back when it first popped up (I was in high school and I enjoyed Kevin J. Anderson's trilogy), but around the time of THE PHANTOM MENACE, when we finally received a canonical Jedi Order, all the stuff with Luke's academy started to feel wrong based on what the movies were telling us. That said, I admit that I didn't read much into the "New Jedi Order" era -- I really stopped with STAR WARS novels around the time Episode One hit theaters, so I've read very little of the post-original trilogy books which were influenced by the prequels -- so I probably don't have enough information to state an educated opinion. These were things I had waited well over a decade to see realized on screen and I was completely satisfied with what I got! You know, I enjoyed that trilogy as well, reading it right around that time, and it wasn't until I started hanging out on the internet that I learned its largely derided amongst fans, even/especially EU fans. around the time of THE PHANTOM MENACE, when we finally received a canonical Jedi Order, all the stuff with Luke's academy started to feel wrong based on what the movies were telling us. I see what you mean - and the later New Jedi Order books definitely did "feel" more like what we were getting contemporaneously in the Prequels, in terms of the Jedi, because, of course, the writers were now getting the stuff from the movies, and in-universe, they came up with a few ways to get Prequel-era info to Luke, so it made sense for him to adopt some of the elements of the old Order into his new one (while leaving behind other elements, like the whole "no romantic attachments" thing).